Quiet Please was one of radio’s most imaginative series, created and written by Wyllis Cooper, the talented writer/director who created radio’s legendary Lights Out in 1934 and scripted the 1939 horror film The Son of Frankenstein. "Wyllis Cooper was one of the most imaginative, creative writers that radio ever had," recalled actor Lon Clark. "His work ranks among the very best shows I ever worked on during my years in radio." 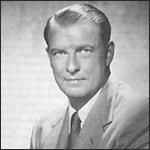 Ernest Chappell starred in the series, narrating the stories in a quiet, underplayed conversational tone. Quiet Please aired over the Mutual airwaves from June 8, 1947 through September 13, 1948 and over ABC from September 19, 1948 through June 25, 1949. 1. Wyllis Cooper's Quiet, Please! (2/6/1949) "Tap the Heat, Bogdan"